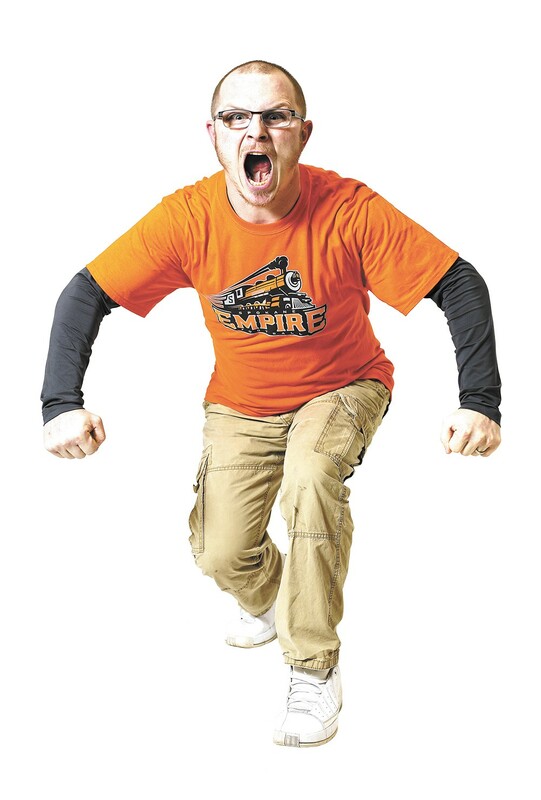 Keith Witt is the man behind the mask as the Spokane Empire's new mascot. "You ever been in a suit before?" As far as smack talk goes, that's not exactly Muhammad Ali or Richard Sherman. But delivered as it was, with an innocent lilt and a smile at the tryouts to become the first Spokane Empire mascot, it made clear that at least one of the competitors on hand had experience in the costumed-character game. That competitor, 29-year-old Keith Witt, is going to be the man behind the mask and in the mascot suit for Spokane's arena football team, opening its inaugural season Saturday in the Tri-Cities as part of the Indoor Football League. The Spokane team took on a new name, ditching the Shock, when it left the Arena Football League. Witt was a rabid Shock fan, sitting with the "Goal Line Bandits" fan crew that spent a lot of time getting the crowd pumped. He was ready to try out to be the Empire mascot well before the team announced it would hold open tryouts. "I know a lot of the mascots. I know the Eastern eagle, Swoop. I've met Boomer [the Spokane Chiefs' mascot]. The stuff they get to do seems fun. You're a local celebrity without people knowing who you are." Witt spent some time last year playing Super Otto for the Spokane Indians, dressing as a 7-foot-tall dinosaur in temperatures that were in the 90s outside the suit and considerably hotter inside. He's also spent some time as a mascot hired gun, dressing as the Red Robin Bird and the Arby's Mitt for some special events. At the Empire tryouts held at the downtown YMCA about a month before opening night, Witt works the room like an old pro. He does some gymnastic moves and push-ups to showcase his strength, does a little break dancing, and delivers some spazzy flops and quick spins in a T-shirt and shorts before donning a hamster outfit provided by Empire officials to show that he has serious moves — even when wearing a giant rodent head. "I can dance pretty well," Witt says of the skills he brings to the role. "I'm pretty athletic. I can break dance without breaking dancing." The Spokane Empire's new mascot, yet to be named. Ryan Eucker, the team's director of operations, wasn't going to bring the hamster costume, but he and his fellow Empire officials who ran the tryouts figured they wanted to give the competitors every option to impress. "Our original idea was, no, we're not going to let these people dress up," Eucker says. "We're going to put them out there in their true skin, because if they're comfortable jumping around and dancing and doing their thing without the costume on, they'll be that much more comfortable behind the mask." Witt is clearly comfortable as he chats up the hiring committee. Asked in the job interview why he'd fit the role, he coolly answers, "Whether it's behind the mask or in front of the mask, I'm very people-oriented." For Witt, a father of three who does data analysis for energy companies by day, becoming a mascot is a culmination of a lifelong love of cuddly, costumed cheerleaders. "I grew up in Kansas, and the KC Wolf came when I was in third grade. I remember everything about it," Witt says of meeting the Kansas City Chiefs' mascot as a child. The Spokane Empire's mascot doesn't have a name yet; it probably will be picked by fans in a contest or vote. Being the mascot does come with some responsibilities. Witt can't be photographed drinking beer or doing anything unseemly in the costume, or post any inappropriate photos on social media. He can't be a distraction during the national anthem, or distract referees or players on the opposing team. He can never speak while in costume, and must never dress, undress or remove the head in public. A couple of weeks after getting the gig, Witt is anxiously awaiting the arrival of his costume from the company putting together the cartoonish engineer outfit. In the meantime, he's plotting out some moves to make the role his own. He might join the players for touchdown celebrations, or come up with a personalized handshake for some of the players to use during team introductions. Wearing the costume will go a long way toward what becomes part of the repertoire. And if there's anyone more eager for the season to start than the players, it's Witt.